Multi-sided machining fast and secure. HSC milling (High Speed Cutting) is a process in which the CNC milling machine processes the workpiece at very high cutting speeds (the feed rate increases by five to ten times) and constant cutting depths. In this method the constant chip cross section and the consistently low cutting forces (up to 30 times reduced cutting forces) are crucial. Due to the high machining performance during roughing and the high surface quality during finishing, the production can be accelerated. An optimal cutting performance through always soft and tangential tool paths also guarantee an extremely high surface quality. The productivity increases significantly using this method. High Speed Cutting is now used in a wide variety of areas. Whereas the areas of application used to be mainly found in 3D mold- and tool making, high-speed milling is becoming increasingly popular in all other areas of machining, e.g. the 2D / 2.5D machining. Another important point for fast and efficient CNC machining is the avoidance of air cuts. 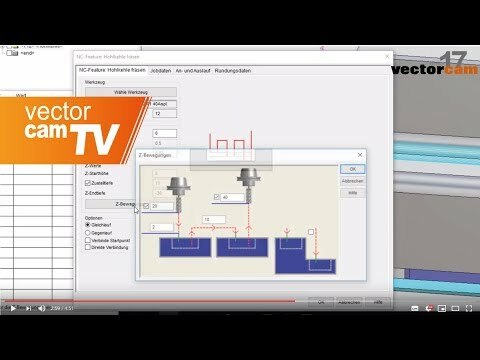 To avoid these air cuts, the function integrated in vectorcam uses a defined blank geometry. The blank geometry can take any three-dimensional shape. The toolpaths are calculated on the basis of this 3D blank. As a result the machine moves without air cuts.